The 150-year-old Oakland institution suffered a huge loss in enrollment and is facing a challenging financial outlook and a bitter legal fight with a former professor. Holy Names’ enrollment plummeted 36 percent in four years, and the school is being monitored by the U.S. Department of Education. 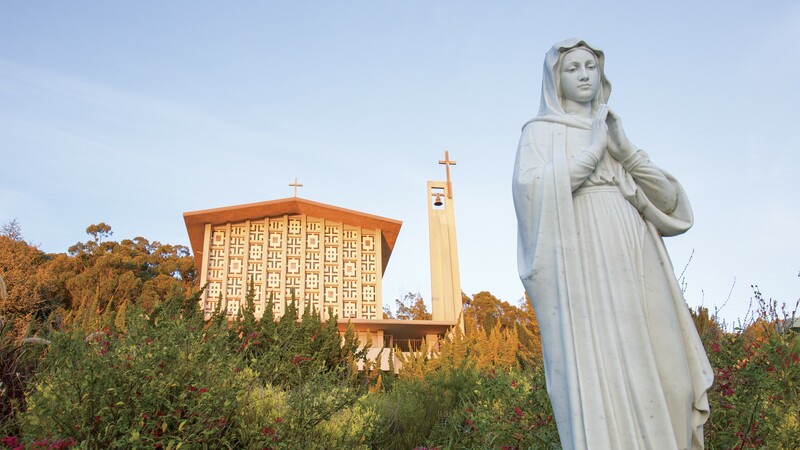 For nearly 150 years, Holy Names University in Oakland has educated thousands of students from all over the world. The private nonprofit university was founded in 1868 on the shores of Lake Merritt and has grown considerably since then — adding graduate studies in 1955 and moving to a wooded, 60-acre campus in the Oakland hills in 1957. By 2013, the Catholic institution enrolled more than 1,300 graduate and undergraduate students. But the university has recently fallen on hard times, with its enrollment plummeting nearly 36 percent in four years. By 2016, only 866 students attended Holy Names, depriving the school of much-needed revenue. In the most recent reaffirmation of the school's accreditation in 2016, the Western Association of Schools and Colleges concluded that Holy Names "should consider structured programs to conserve cash and assess viability to survive." Records from the U.S. Department of Education from September show that the school is under heightened cash monitoring — an indication that it is the subject of an investigation that may have uncovered financial mismanagement. A Department of Education official said the department would not confirm or comment on ongoing investigations. University officials say the college is in the process of turning around its enrollment problems with new recruiting strategies that have recently tripled the number of student inquiries. The school had a record number of new enrollees in fall 2017, said Alan Liebrecht, Holy Names vice president for Strategic Enrollment Management. Liebrecht was brought on in 2016 to help turn around enrollment. He said he's widened the university's recruitment area, bringing more students from Southern California and the Central Valley. University spokesperson Sonia Caltvedt said the school's financial situation is improving, and the university expects it will be removed from heightened cash monitoring in July. She pointed out that many small liberal arts colleges are struggling financially. But Holy Names has also been mired in a nasty legal fight with a disgruntled former business professor, Hector Saez. In fact, many of the challenges facing the university came to light through a lawsuit that Holy Names brought against Saez. The college accuses him of defamation for starting a website that alleges the university has poor academic standards. Saez's portrayal of the university, however, has been confirmed in sworn statements from other former faculty members. In addition, the university's six-year graduation rate is only 45 percent, which is far below the national average of 66 percent at private nonprofit institutions, according to the National Center for Education Statistics. According to the university, Saez was fired for harassing students and assaulting a student at the university pool in 2014. Saez contends that he only pushed away a student who was being aggressive and threatening and that the university used the incident as a pretext to fire him because he'd been organizing faculty to take action against declining standards in academics and admissions. After he was fired, Saez sued the school for wrongful termination, and Alameda County Superior Court Judge Andrew Steckler eventually ruled that the university had not followed due process in his termination. In multiple interviews, university officials also acknowledged the factual accuracy of many of the assertions Saez has made about the college. Saez started a website in spring 2015 accusing the school of failing its students by fostering an academic culture that allows students to coast through their education without serious study. He visited the campus, posting fliers and dropping a banner to promote his website, at one point getting into a confrontation with a security guard, which the university says led to another alleged assault — a charge Saez denies. The university sued Saez for defamation on June 21, 2016, alleging that he made false statements on his website, objecting to his writing, "This school is a joke" and "HNU students do not develop the skills necessary for good jobs," among other things. In a statement to the Express, Caltvedt wrote, "We deny and dismiss in the strongest terms any misguided and ill-motivated claims of a lack of academic integrity meant to hurt the school and its generations of successful graduates and those yet to come." Saez, whose expertise is economics, was hired by Holy Names in fall 2012. In an interview, he said he was shocked at the levels of apathy from the students there. He had previously taught thousands of students at the University of Vermont and Washington State University and said that while every school has some students who aren't fully engaged with the material, at Holy Names "a critical mass of students was just not caring about what was happening in the classroom." Students were showing up without notebooks or textbooks, didn't do in-class exercises, left in the middle of class, and generally had no interest in learning, he said. Despite that, these students expected to pass and some even expected good grades, he added. At a faculty senate meeting in October 2012, many other professors shared Saez's concerns and a second meeting was convened later that month specifically to discuss these issues. Minutes of that meeting reviewed by the Express reveal further issues with student performance — that students were engaging in plagiarism and had no expectations of performing beyond the bare minimum, with several faculty members reporting hearing the phrase, "D gets the degree." Saez concluded that the university had been recruiting many poor and minority students but without regard with whether they were prepared to start college. A native of Puerto Rico, Saez said that helping underserved students would be a mission he'd support but he found that the school lacked the programs to be able to bring these students up to college level. "The university promotes itself as having a very low ratio of students per classroom," Saez said, "but that very low ratio is achieved by having lots and lots of underpaid adjunct faculty who have recently unionized because of the working conditions there." According to the university, it employs 42 full-time faculty and 134 adjuncts. In April 2016, the adjunct faculty voted to organize under Service Employees International Union. Students at Holy Names — which can cost up to $52,809 per year to attend — tend to be low-income, with 99 percent receiving financial aid and 47 percent of first-year students receiving Pell Grants. But only 11 percent have all their financial needs met through aid, and the average student loan debt for an HNU graduate is $46,900, according to statistics provided by the university. Charlie Sarno, dean of the School of Business and Applied Social Sciences at Holy Names, said in an interview that while some students arrive with poor study habits due to either being the first in their families to go to college or being unprepared by their high school, he doesn't think it's a bigger problem than at other colleges and universities. "They're generally smart and hardworking, but they may have some learning to do about how to learn," he said. He said the school has some remedial courses to teach things like basic study habits and time management. In 2014, Holy Names implemented a retention task force after its first-year retention rates dropped to just 60 percent. It rose to 80 percent in 2016, according to figures provided by the university. Liebrecht, who is in charge of admissions, disputed the idea that the university took students who weren't ready for college. He said the average high school GPA for a Holy Names student is around 3.2 and has been for years. While he is new to Holy Names, he said he has found the university to have pretty good standards. According to Liebrecht, Holy Names went from 6,000 inquiries for its fall class and 900 applicants in 2016 to 15,000 inquiries and 2,800 applicants in 2017. "Just telling people about us and telling more people I think has helped put us in a better place," Liebrecht said. "It makes me feel like this is a really good quality of place to see that growth happen so quickly." But former teachers and students have come to Saez's defense in the defamation lawsuit. In a series of sworn statements, several former professors and students described a poor academic environment staffed with underpaid professors with numerous apathetic students who are woefully unprepared for a college-level education and leave ill-equipped to find employment. Joan Edelstein, an instructor at the UC San Francisco School of Nursing, said she was an adjunct faculty member at Holy Names University from 2003 to 2005 and again from 2010 to 2013. She said there was significant turnover in the program and the education suffered as a result. "The administration fostered instability among nursing faculty by paying them poorly — even seeking to lower salaries," she said. Julie Henderson, a tenure-track professor at Holy Names from 2008 to 2015 who taught graduate-level courses in education, said she found many Holy Names graduates lacked proficiency in their majors and were unprepared or badly unprepared for graduate-level work. "I believe that HNU's tenuous financial stability as a tuition-reliant institution led to the admission of too many teacher-candidates with HNU degrees whose underpreparation made completing the program successfully and obtaining teaching credentials within a reasonable timeframe extremely difficult and very costly," Henderson said. Hede Gustafsson, a former student who graduated with a bachelor's degree in business management in 2013, said that when he returned to his home in Sweden and pursued a graduate degree, he had to obtain another undergraduate degree because his education at Holy Names did not prepare him for graduate school.